Palmer High School is a great place to learn, grow, and meet new people. Palmer High School, located in Palmer, Alaska is home of the MOOSE! It’s the only school in the district that participates in the International Baccalaureate program, allowing high school Juniors and Seniors to take rigorous classes that they can potentially earn college credit for. If students decide to take part in the IB program they must take three standard level and three higher level classes, as well as TOK (theory of knowledge). Upon finishing all standard and higher level classes students must take IB exams for the classes they took. the scores they receive on these tests will determine whether or not they obtain college credit. Palmer High School also has many clubs and after school activities for students to take part in. Some of the most popular are Student Government. At the end of every school year students from each grade level take part in a campaign to decide who will become president, VP, treasurer, etc for each grade level. Starting the next school year Student Government members have meetings every week and work on things like school dances, prom, assemblies, and ASAG. Overall Palmer High School is a school that allows students of all interests to learn new things, grow as a person, be involved in the community and share friendships that will last a life time. 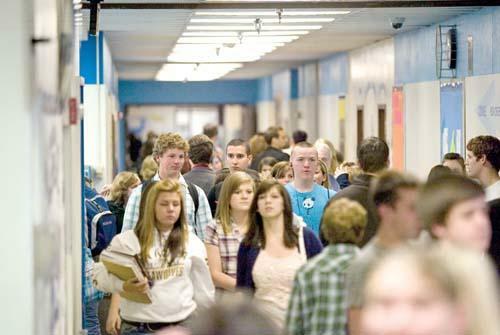 Students at Palmer High School crowd the hallways at the end of school Thursday afternoon. Palmer High is the only Alaska school to make the Newsweek magazine list of top high schools in the country.